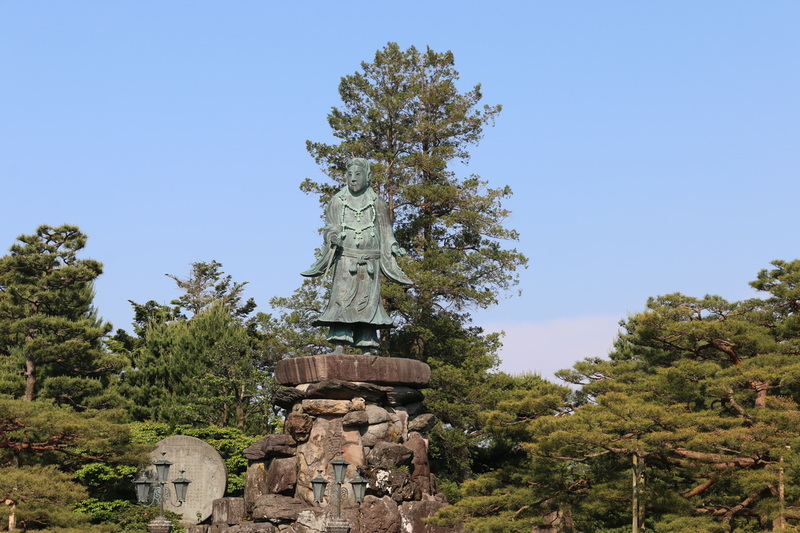 From Osaka we started our journey to the western outskirts of Kyoto, Arashiyama. 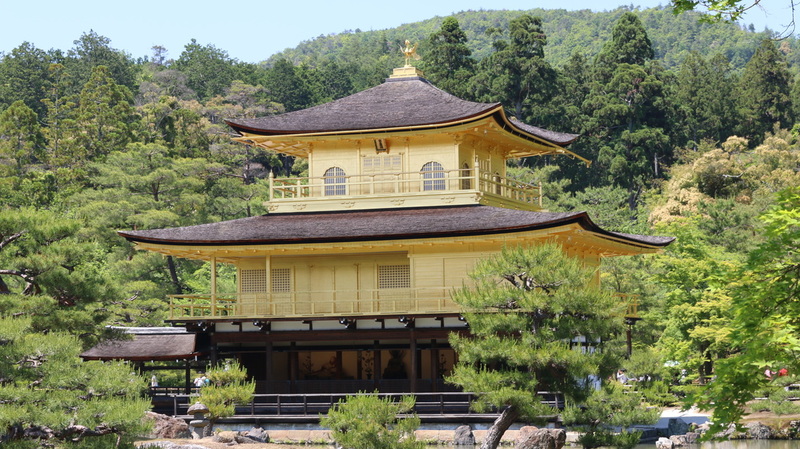 Here we visited the Kinkaku-ji Temple which is one of the five great Zen Temples in Kyoto. 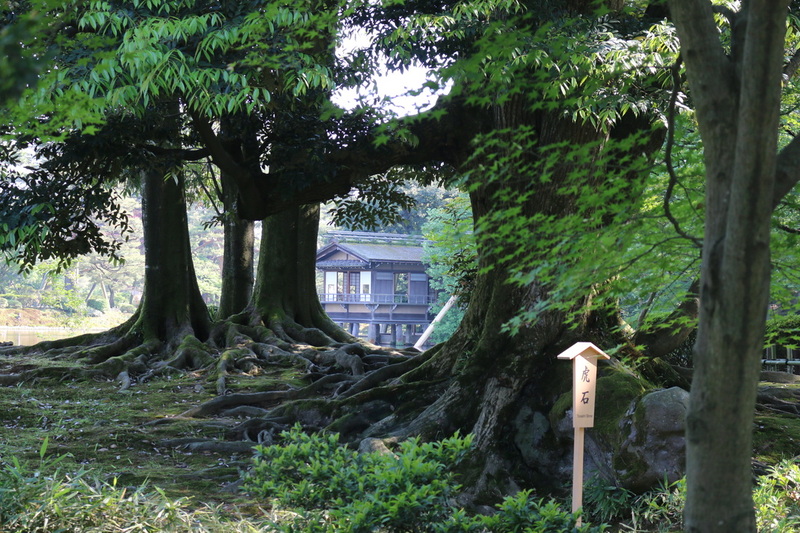 It is the largest and most impressive temple, another UNESCO World Heritage site. 2. 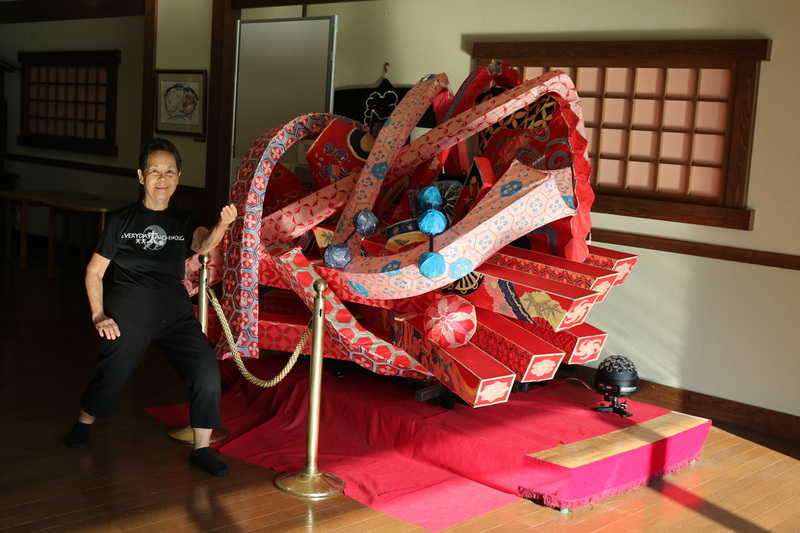 To See Tai Chi Aloha in Japan, click here. 4. 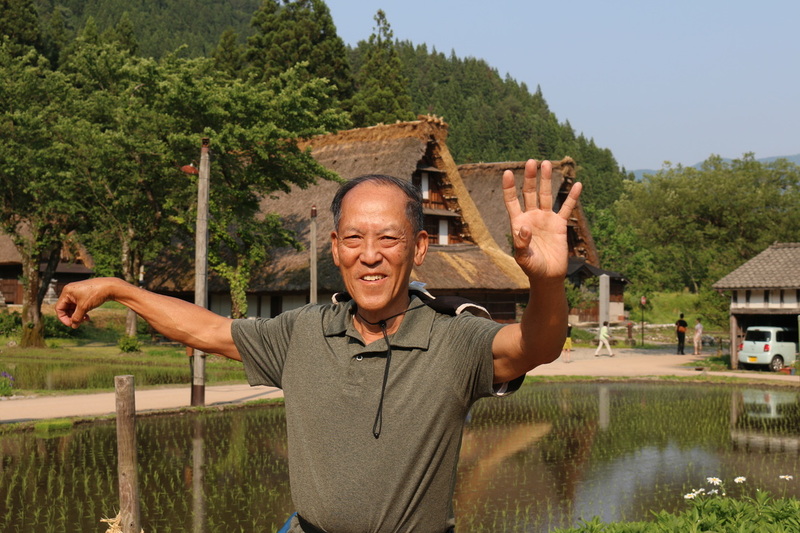 To See YouTube Playlist: Tai Chi Aloha Around the World, click here. 5. 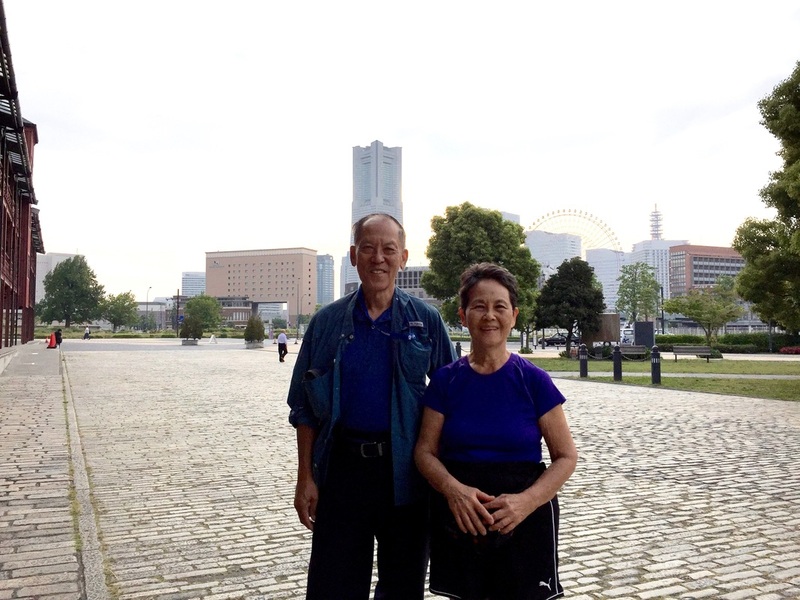 To See Lucy & Ken play tai chi in Japan, click here. 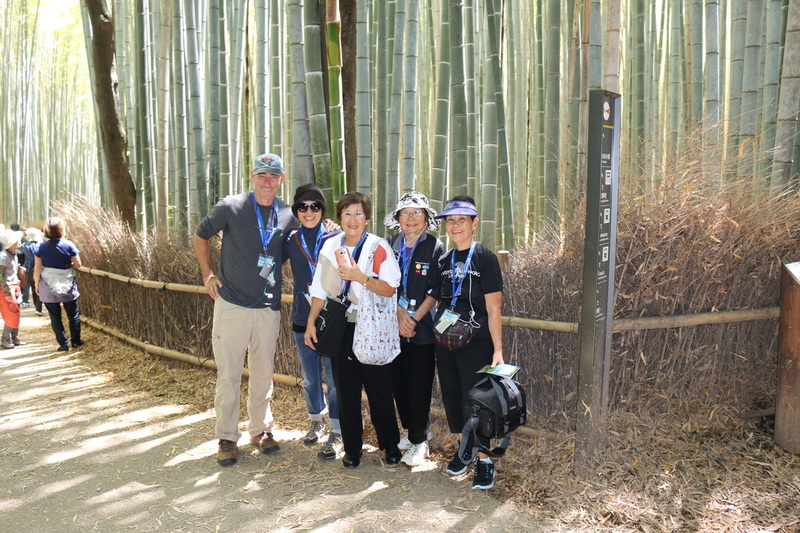 While walking down the path with a light breeze, we enjoyed the beautiful mellow sound and movement created by the bamboo at Sagano Bamboo Forest. 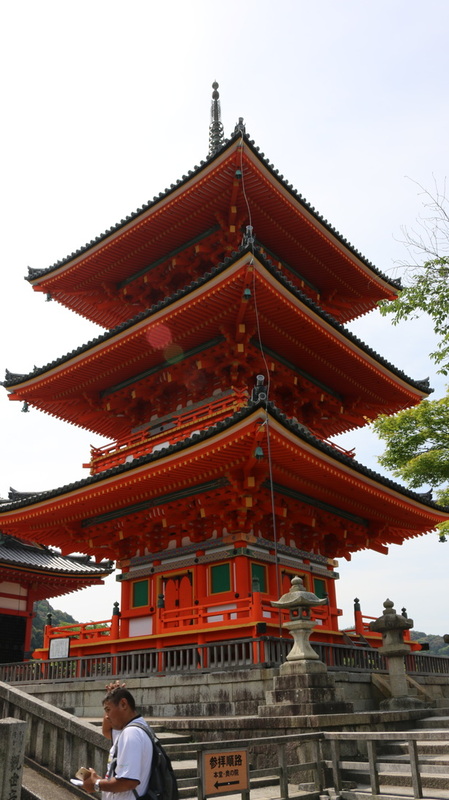 The historic Kiyomizu-dera Buddhist temple in eastern Kyoto is a UNESCO World Heritage Site. 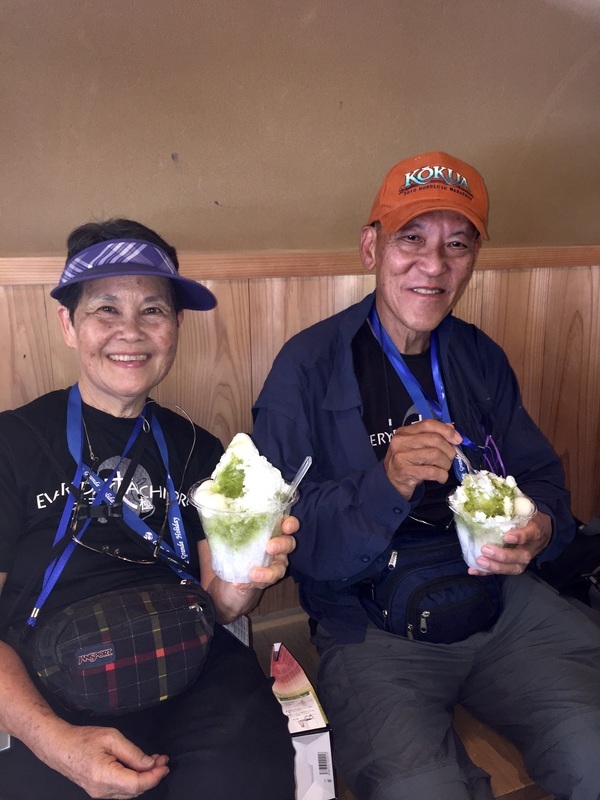 Wherever we went there was always time for green tea ice cream or green tea shave ice! 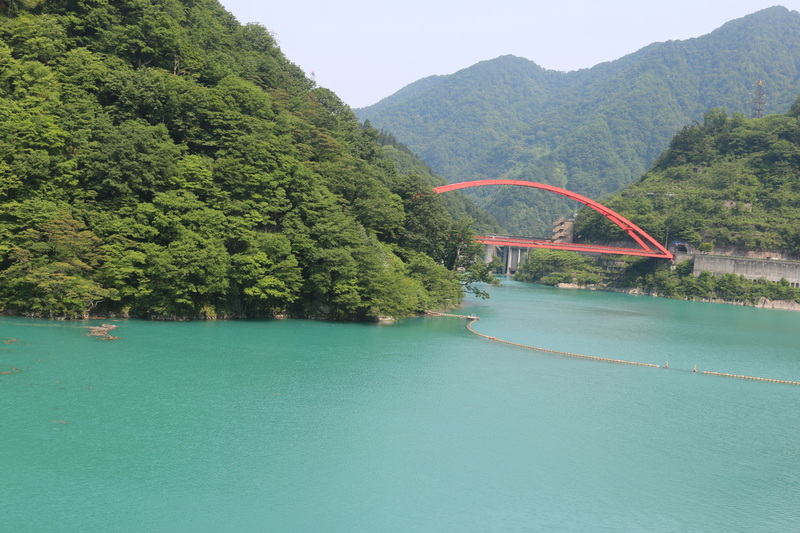 At the Moon Crossing Bridge, Togetsukyo, we went across the bridge to play tai chi. 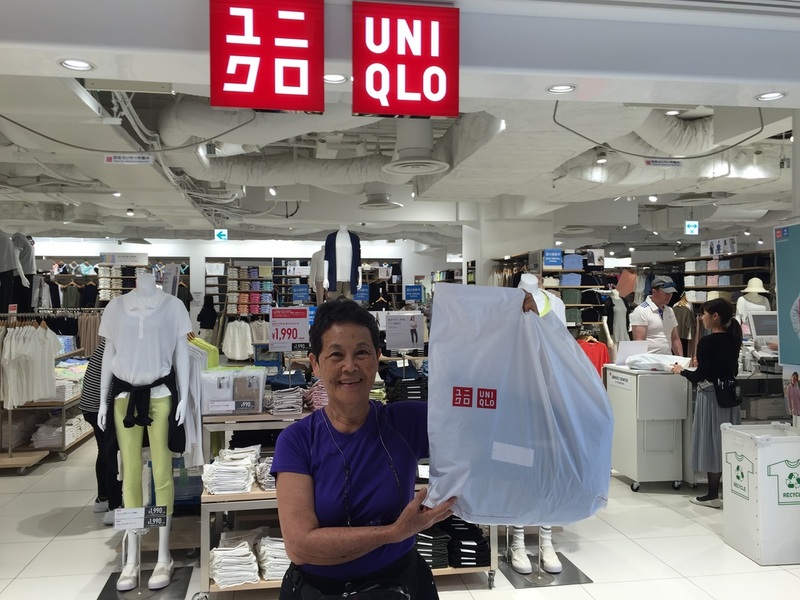 Site seeing to all the many temples and craft villages was offset with lots of shopping time at our favorite stores, UNIQLO and Daiso! 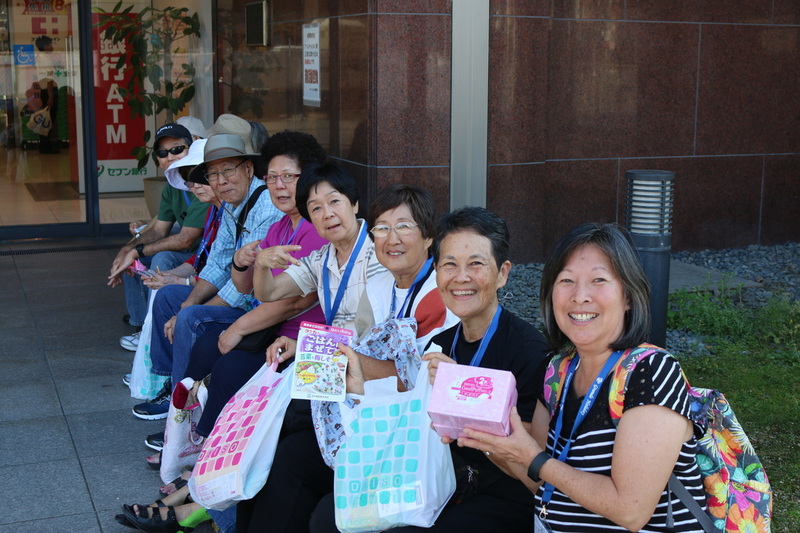 Some of us are the happiest travelers when we can get some great shopping deals at the 100 Yen Store... this rounds off our day!! 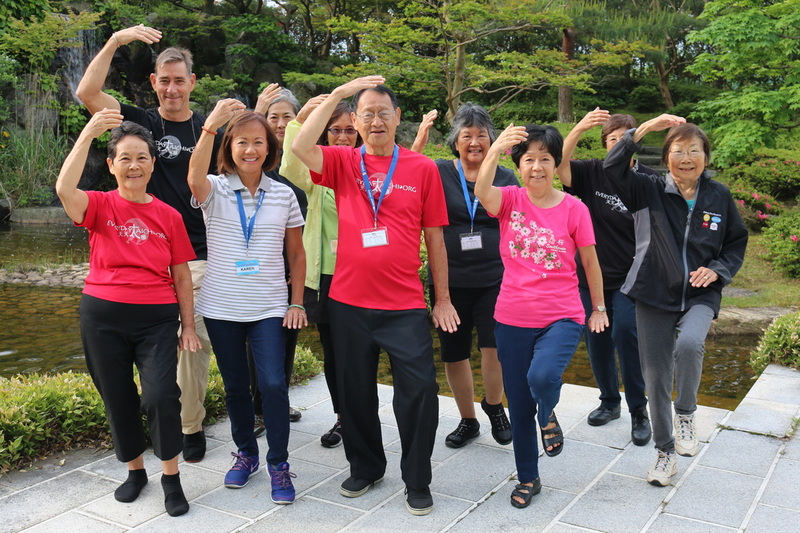 Most of all, we played tai chi early in the morning before our big breakfast buffet. 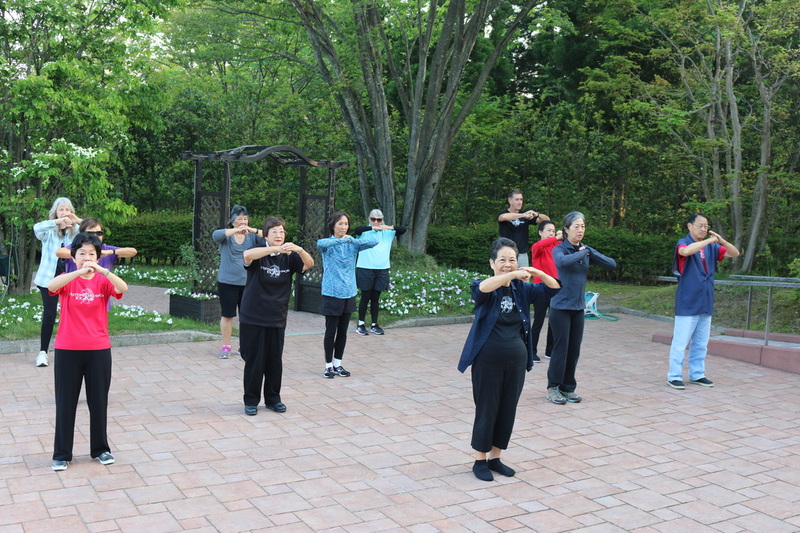 We woke up as early as 5:15AM to start our day with tai chi 30-45 minutes which helped us to feel energized. 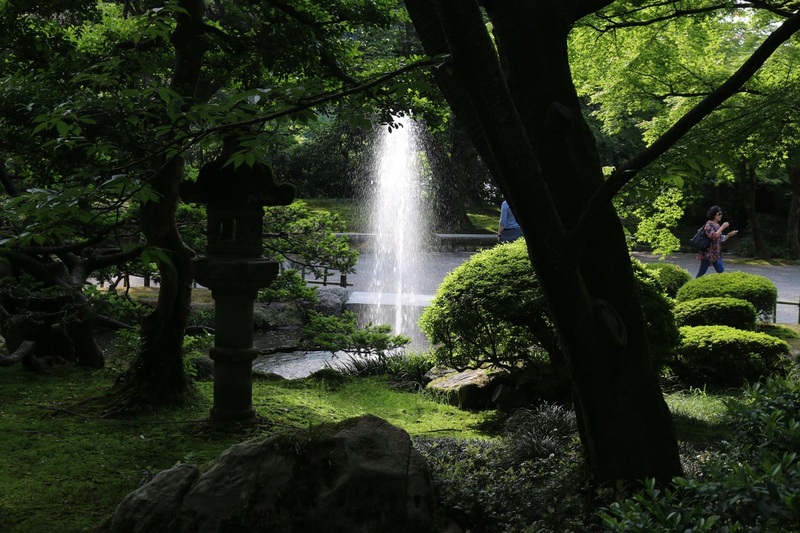 We loved Japan for their priority and focus on detail which was exemplified in their gardens, a photographer's dream. 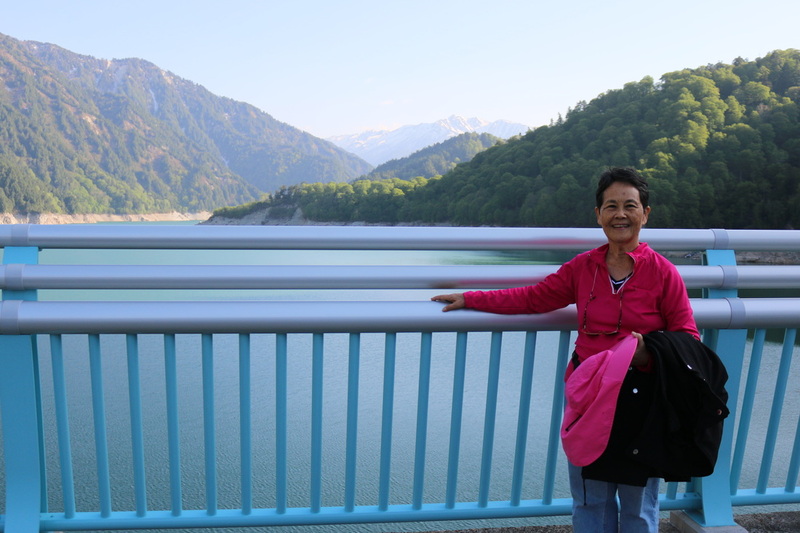 The Hida Mountains or Northern Alps are one of the finest areas of natural beauty and the Kurobe Gorge is among the most spectacular places in the Hida Mountains.The train ride made us feel close to nature. 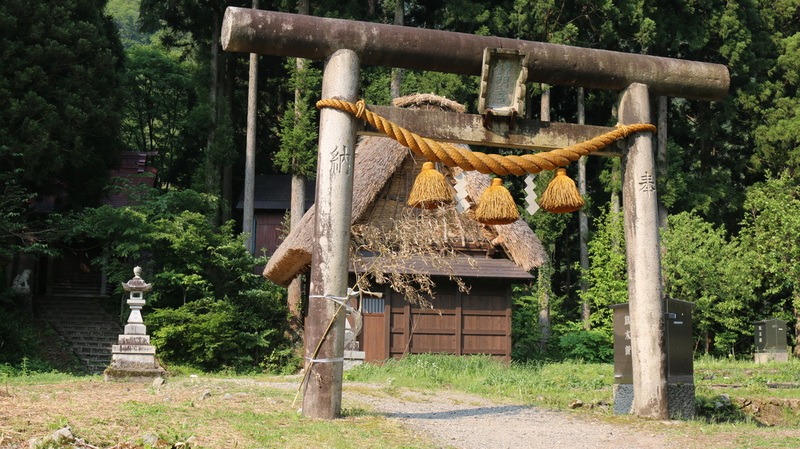 The Gassho-zukuri, "prayer-hands construction" style houses are characterized by a thatched and steeply slanted roof resembling two hands joined in prayer. This unique architectural design withstands and sheds the weight of the region's heavy snowfalls in the winter. 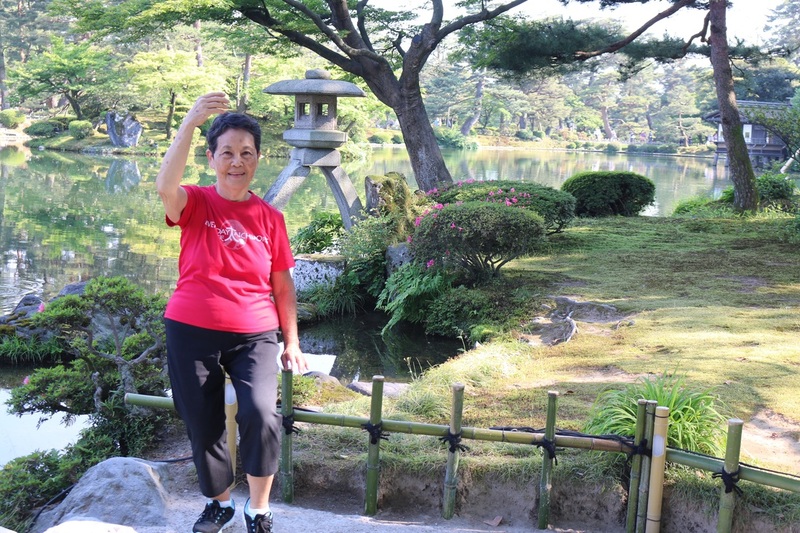 As we begin our day with warm up exercise, we have come to learn to appreciate the Japanese culture of honesty, cleanliness, politeness and special attention to detail. 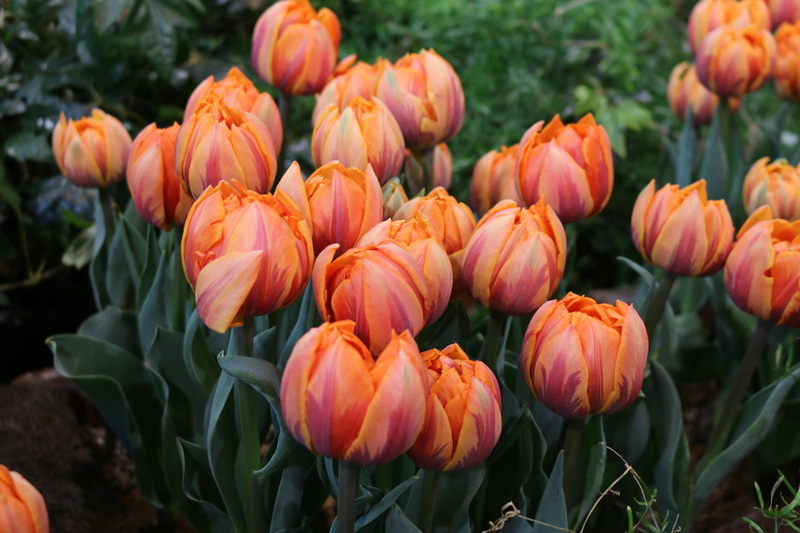 The Tonami tulip gallery is the world's only flower garden where it is always spring and tulips bloom all year long. Here we saw soo many tulips of all blends of the rainbow and many other unique flowers in full bloom. 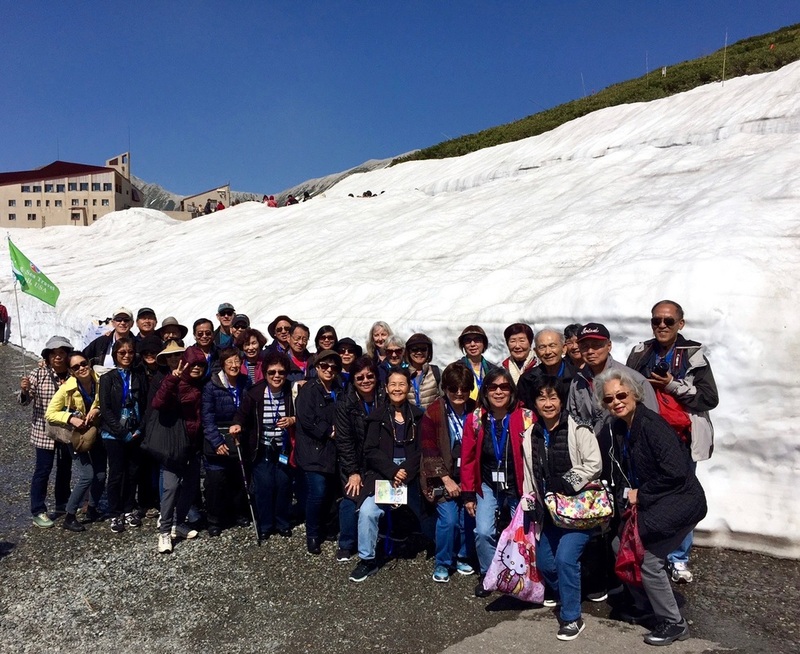 The Tateyama Kurobe Alpine Route is known as the "Roof of Japan." Here we saw steaming volcanic valleys and stunning vistas and unique landscapes as we got nearer to the majestic Mt. 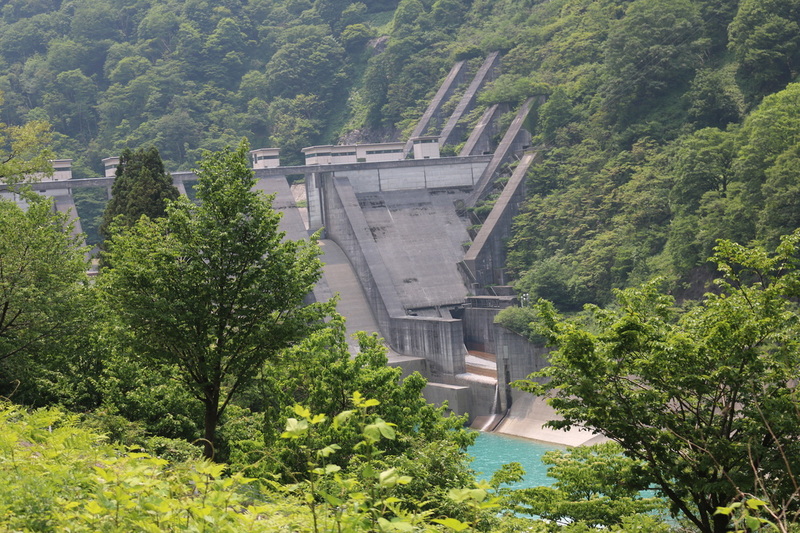 Tateyama. 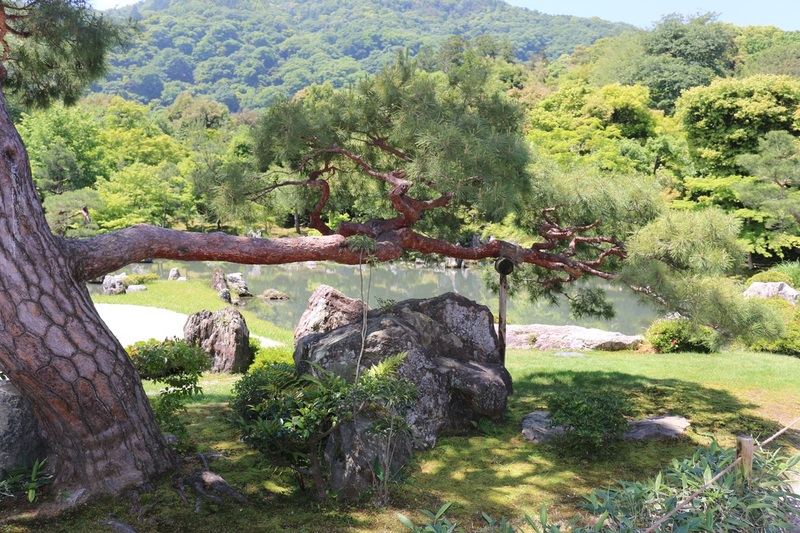 First, we took a cable car to see the timber rocks, a unique rock formation. Then rode in the highland bus and with the altitude change we saw large trees in the forest, the highlands and spectacular mountain range. We walked through the two walls of snow. 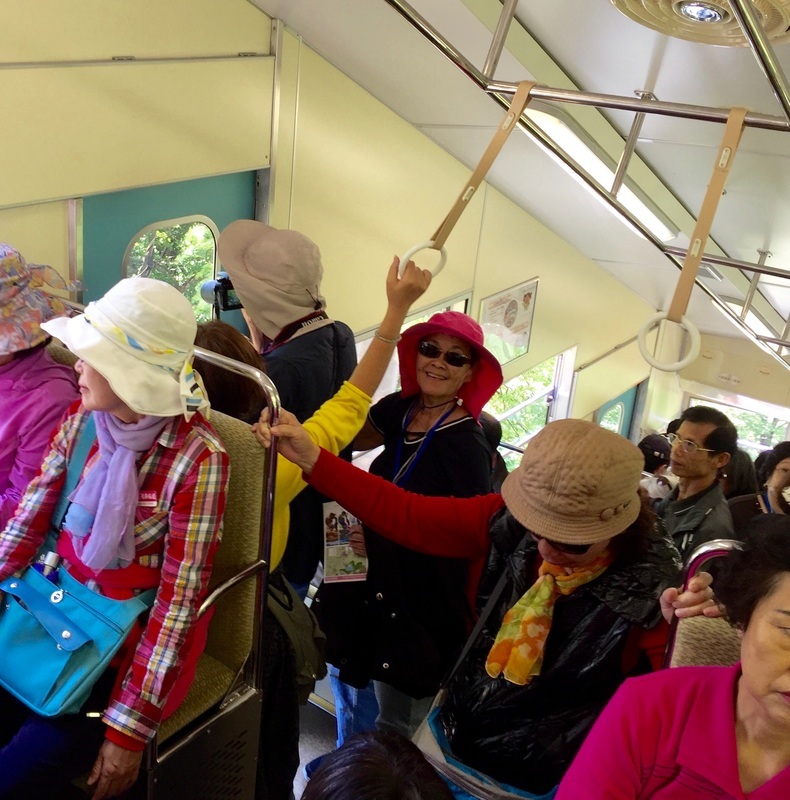 Although we were prepared for both rain and cold, cold weather, we had especially nice comfortable weather.We then took a trolley bus, the highest altitude trolley bus in Japan. The bus runs inside a tunnel piercing through the heart of Mt. Tateyama at 3015 meters high. The bus is powered by electricity so it does not produce exhaust fumes. Our cable car ride allowed us to be on a "moving observatory" giving us a full panoramic view of nature. 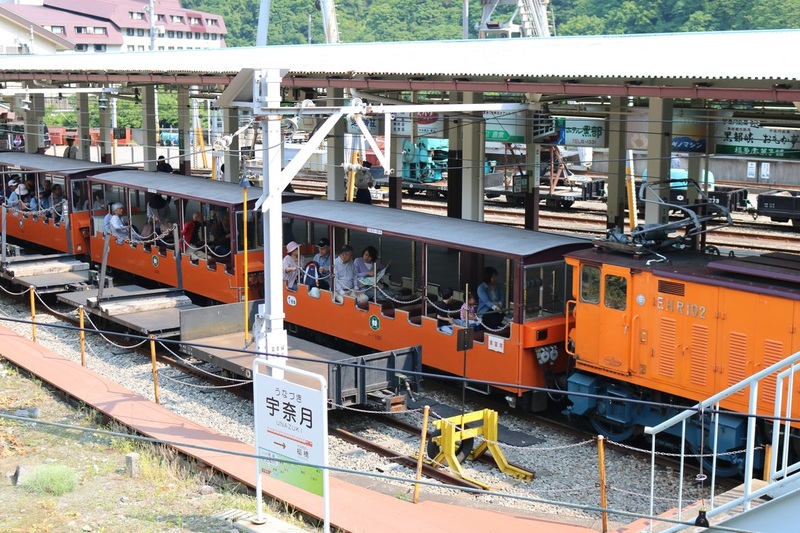 We also took a tunnel trolley which crossed the border between Toyama and Nagano Prefectures. We are overwhelmed by such a site and the once in a lifetime experience. Our onsen bath awaits us after a special banquet dinner in our yukatas. 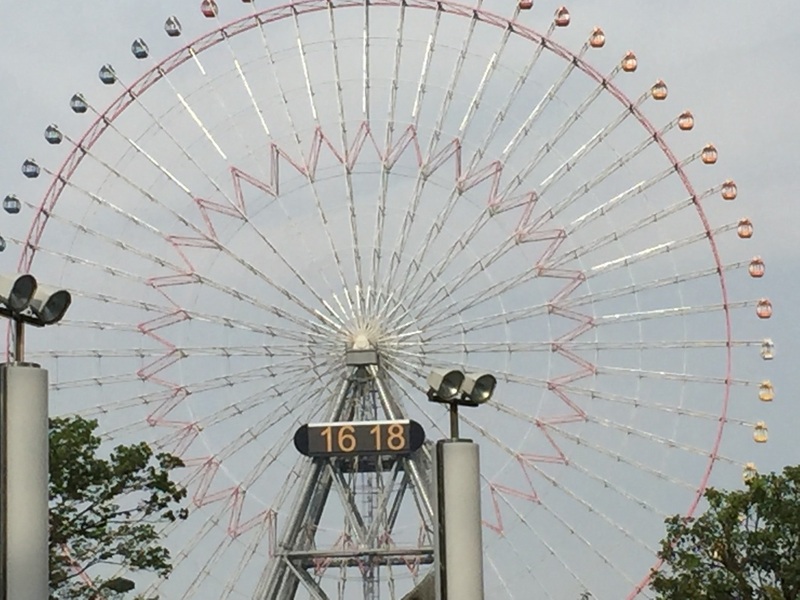 We journeyed on to Tokyo via Saitama. 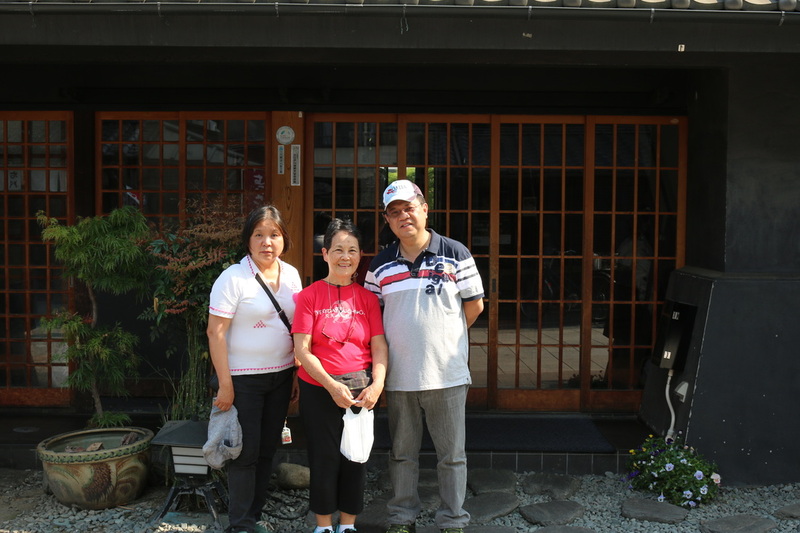 At Koedo Kawagoe, a town that still retain the culture and character of Edo we took a stroll through this ancient town. 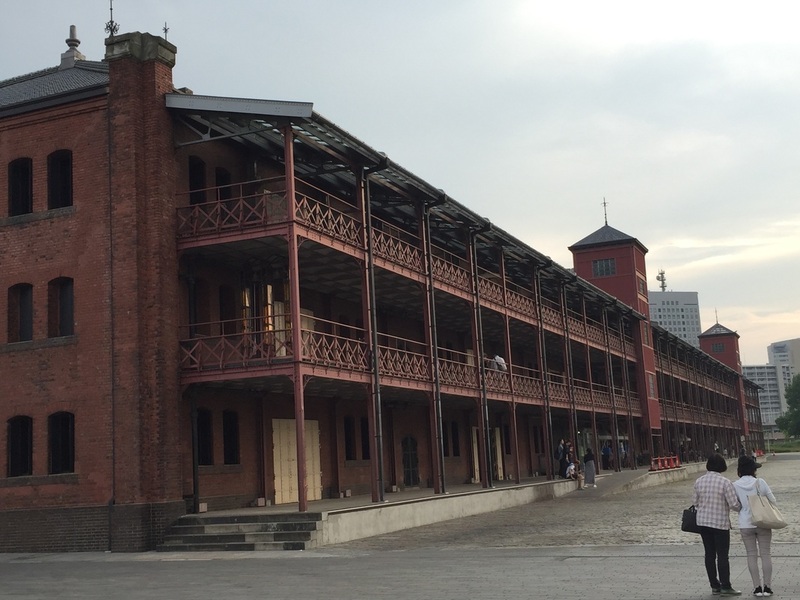 A surprise bonus of our trip was to visit the famous Tsukiji Fish Market, soon to be relocated! It was fun to be able to eat as we walked through the many seafood shops. We even had some deliciously soft and flavorful fresh mochi, which helped us forget about the crowd and hot weather that was reaching 90 degrees. 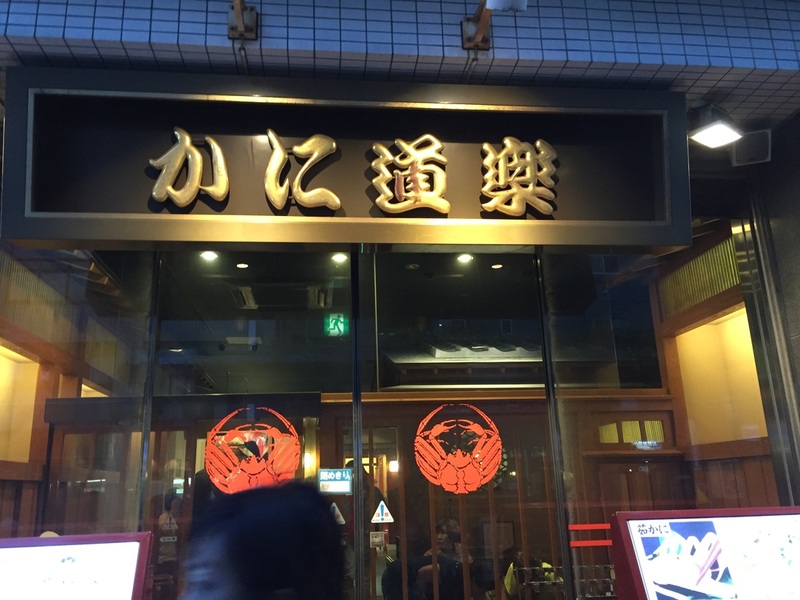 In Odaiba, our farewell dinner at a very special crab restaurant where crab dishes were served in many ways: raw or sashimi style, steamed or shabu shabu style, deep fried or tempura style. What a nice finale to bring closure to our 9 days of traveling with 34 Hawaii friends. 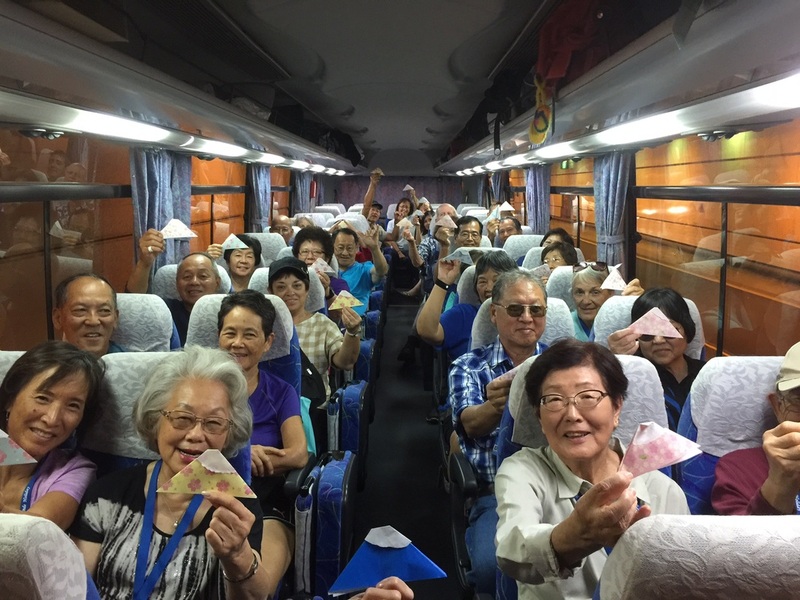 Mahalo to our guides, Henry, Hiroko and Sue! 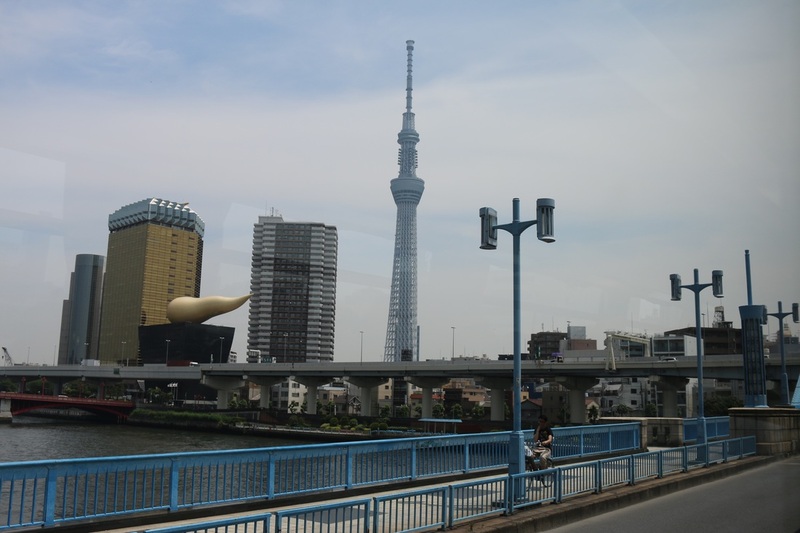 The Tokyo Sky Tree is 643m high which in 2011 was recognized by the Guinness World Records Company as the tallest tower in the world. 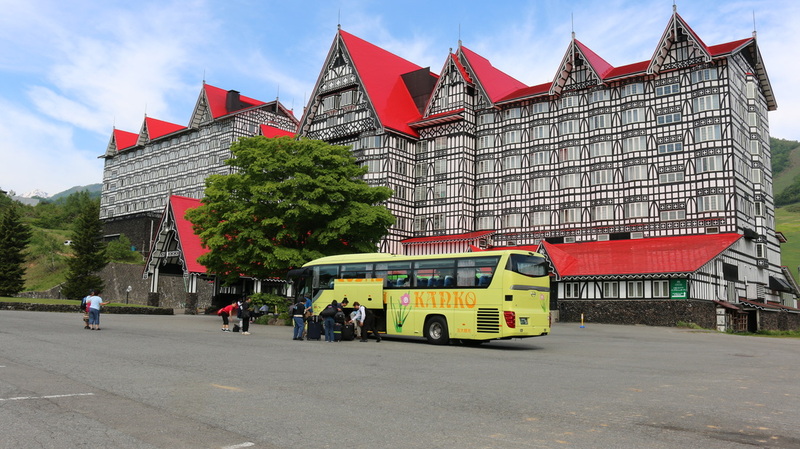 Our bus driver was able to drive round and round and pause in morning work traffic and yet let us view the magnificent buildings of the city from all different angles. We could hear many oohs and aahs as we sighted these uniquely designed famous buildings either because of the appearance and / or because we missed the shot from our moving tour bus! What FUN! A surprise bonus of our trip was to visit the famous Tsukiji Fish Market, soon to be relocated! It was fun to be able to eat as we walked through the many seafood shops. 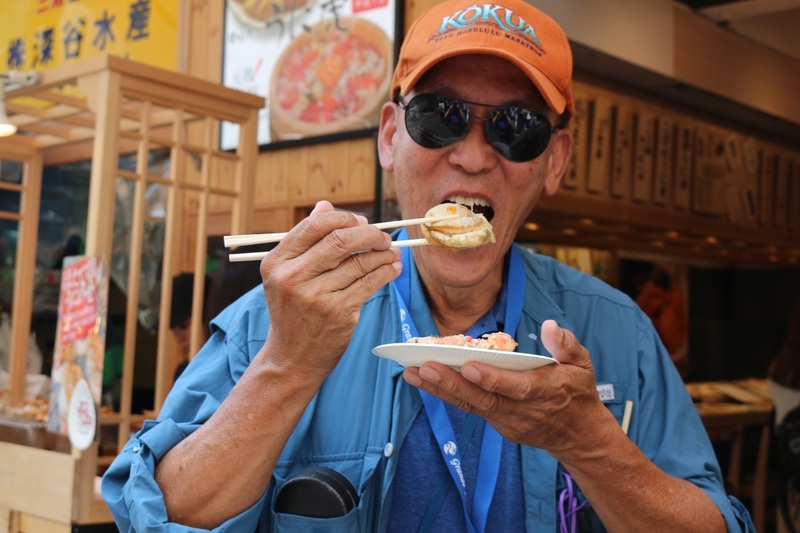 We even had some deliciously soft and flavorful fresh mochi filled with fresh strawberries, mango, peach and green tea flavors, which helped us forget about the crowd and hot weather that was reaching 90 degree. 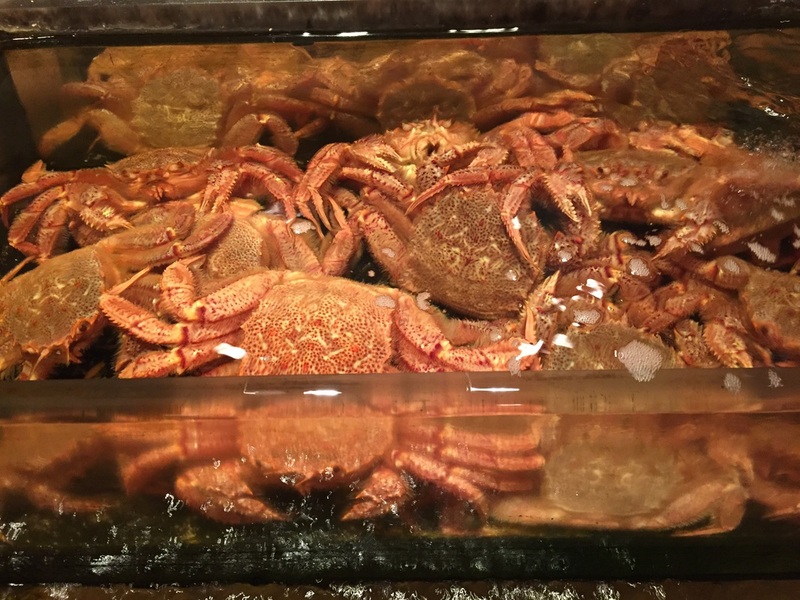 Our memories of a crowded, noisy, bustling, fish market with lots of sea creatures still alive and served so fresh will be remembered for a long, long time. 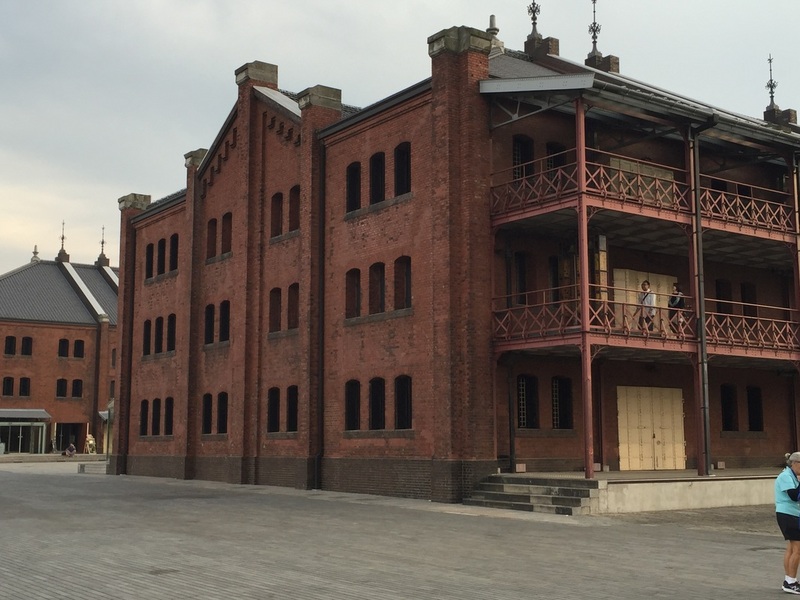 At Yokohama, the second largest populated city in Japan after Tokyo we went to the Red Brick Warehouse, a historical building where the large shipyard of the 1980s. 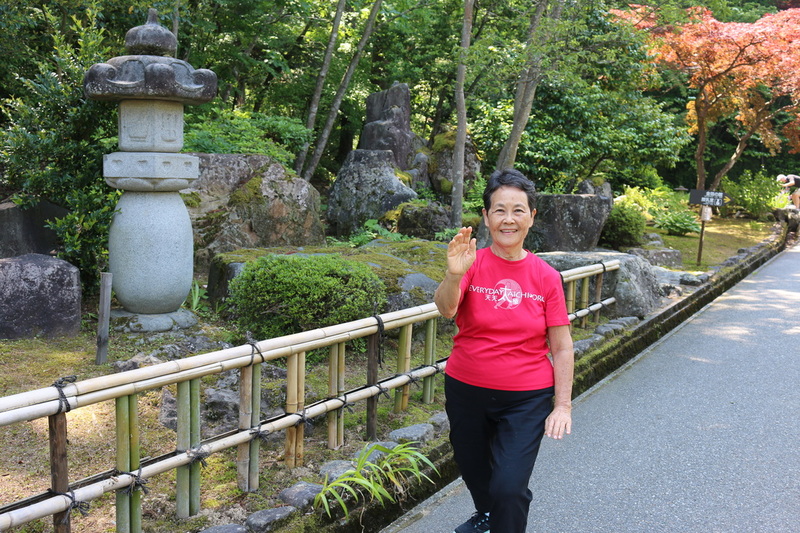 We decided to play tai chi near the harbor and along the path where again there were nice gardens and views with a gentle sea breeze. 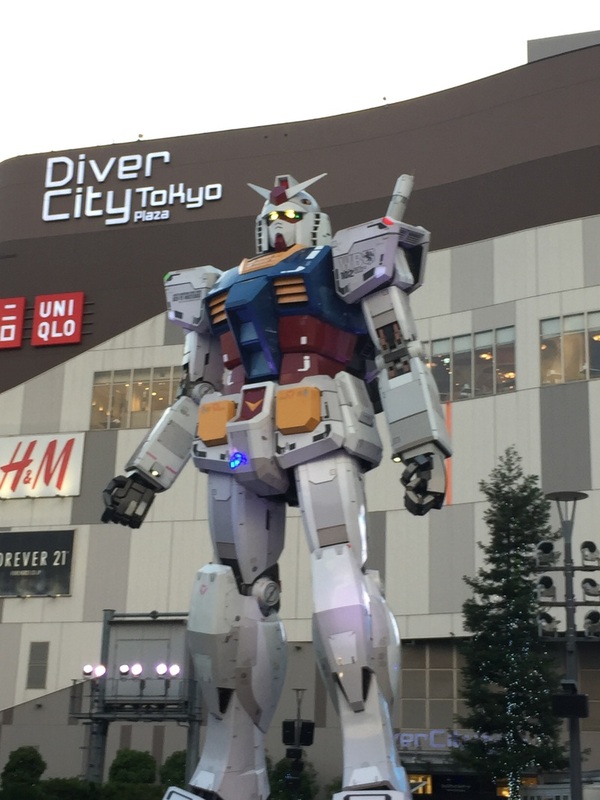 We got to meet the Japanese robot at Soft Bank store in Odaiba Landmark Tower, the tallest building from 1993-2012. Compared to Ala Moana Center, Landmark Tower was HUGE and you could easily get lost because of it was expansive. We saw many familiar shops including Krispy Kreme donut shop. As we waited for our close to midnight Hawaiian airlines flight back to Honolulu, we met up with a HUGE transformer, Gungnam, who gave us a special show at 8:30PM just before we boarded our bus to Haneda airport... so many nice memories of our special trip to the Japan Alps 2016 where it all started because we wanted to play tai chi as we traveled to spread our tai chi aloha around the world.